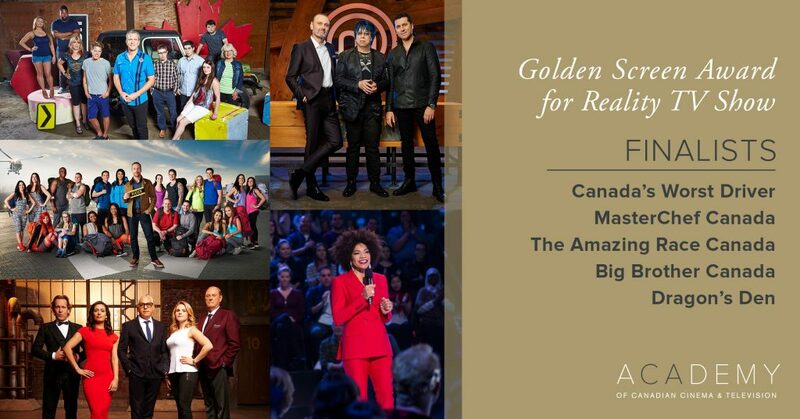 TORONTO/MONTREAL, February 23, 2017 – The Academy of Canadian Cinema & Television announces the finalists for the Golden Screen Award for the most-watched Canadian drama or comedy program and one for the country’s highest-rated reality program. live on CBC from Toronto’s Sony Centre for the Performing Arts. Season nine of Heartland finds the Bartlett-Fleming clan navigating the new normal as each family member starts an exciting chapter, leaving past hurt and hardships behind. With the idyllic Alberta foothills as their backdrop, this tightknit family knows that any challenge can be met and every struggle can be overcome as long as they have each other. Starring Kristin Lehman, Louis Ferreira, Brendan Penny, and Lauren Holly, Motive’s fourth and final season brought the story of the series’ dynamic homicide team to a powerful conclusion as they continued to explore what drives the motive behind the murder. This season saw each member of the team face pivotal choices about their future, as they set on a course of deciding what they wanted their legacies to be. the methodical and dashing detective who pioneers innovative forensic techniques to solve gruesome murders. Starring Jason Priestley and Cindy Sampson, Private Eyes is an engaging drama featuring two strong and forever-competing characters investigating, high-stakes cases of the week, taking them to many diverse worlds and testing their new partnership. Set 11 months after its explosive third season finale, Season 4 of Saving Hope followed Dr. Alex Reid as she returned from maternity leave to confront new changes and challenges. The special two-hour finale saw Dr. Charlie Harris (Michael Shanks) undergo brain surgery to remove an aggressive tumour, only to be faced with a vengeful former patient with a gun at the Hope Zion Hospital Fellowship Awards, leaving Alex and Charlie’s fate in question. Starring Erica Durance and Michael Shanks. Hosted by Canadian Screen Award-winner and Olympic Gold Medalist Jon Montgomery, Season 4 of The Amazing Race Canada featured 10 all-Canadian teams, each compromised of two members with a pre-existing relationship, in the biggest race this country has ever seen. The Racers traveled across Canada and beyond, tackling non-stop challenges and adventures, with dating couple Steph and Kristen crossing the final pit stop first, to win the grand prize. In the ultimate social experiment, a group of strangers live together in a house monitored 24-7 by dozens of cameras and microphones. Each week the houseguests compete in a variety of challenges and one by one, the houseguests vote each other out of the house. At the end of the series the last seven evicted houseguests remaining make up ‘the jury’ and they ultimately decide which of the two final houseguests wins the grand prize! Lead by returning host and Discovery mainstay Andrew Younghusband, the hilarious-meets-educational Canadian original automotive series follows eight drivers, each nominated by a friend or family member, as they attempt to prove they possess the necessary skills to graduate from rehab and escape the unfortunate title of “Canada’s Worst Driver”. Dragons’ Den features five multi-millionaires who have the expertise and the know-how to turn great ideas into incredible fortunes. Each week, fortunate entrepreneurs have the opportunity of a lifetime to pitch their business idea to financiers with the funds and experience to propel their company to commercial success. MASTERCHEF CANADA features esteemed judges Michael Bonacini (O&B restaurant empire), Alvin Leung (Bo Innovation in Hong Kong), and Claudio Aprile (Origin Restaurants), as they guide and mentor a group of competing home cooks through a grueling series of culinary challenges for the chance to win $100,000 and the title of Canada’s next MasterChef. 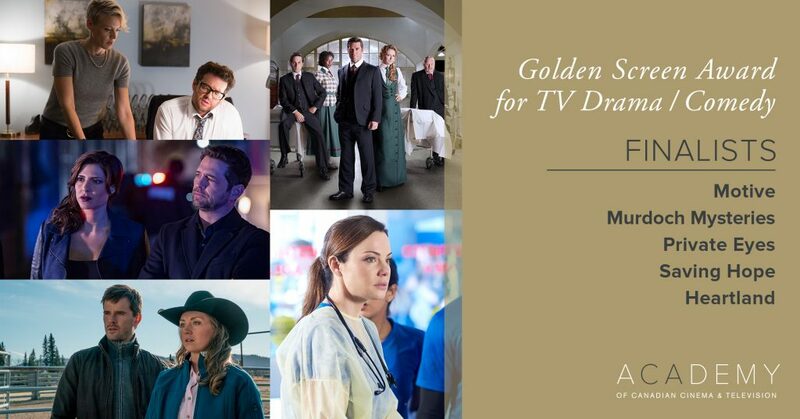 * Audience estimates provided by Numeris based on a list of top Canadian television programming (series, limited series and TV movies) provided by the Academy of Canadian Cinema & Television and their broadcast partners. Analysis based on Total Canada, P2+, Average Minute Audience during the period of September 1, 2015 – August 30, 2016, original airings (“live plus 7 days”) with 50% or more of the airings occurring during the 2015-16 broadcast season.